It’s funny how even a cryptic image like this Sepia Saturday prompt can stir one’s memories. After a brief “hmmm” moment my sub-conscious brought forth the connection. For me this image was a straight path back some fifty odd years. My image today has been chosen from Australia’s wonderful Trove site. While it dates to 1929, a little before my time, it is out of copyright and so can be used here. There are other later photos which you can see if you click the links below. When I was a young girl, my family lived on the north side of the Brisbane River and my maternal grandparents on the south (a very Brisbane division). Neither family owned a car so the only way we could visit (even on Christmas Day) was by public transport…tedious but do-able. On the plus side, the trip only involved two sectors. The first was our local bus, sometimes a trolley bus with feeler-like poles connecting it to the overhead power line, and other times a diesel bus. This would take us to Woolloongabba near the world-famous cricket ground (to the left of this photo). 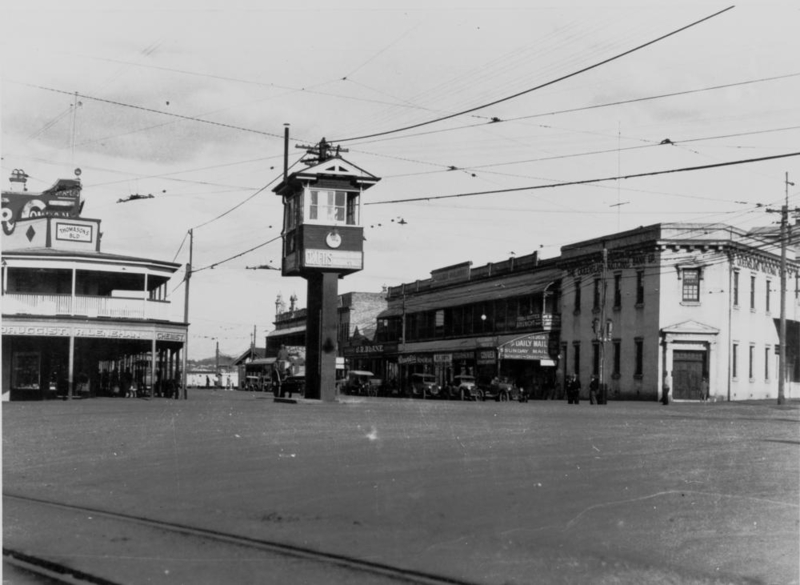 We would cross one of the roads passing through what was known as the Fiveways for its five intersecting roadways, turn the corner, and then wait under the awnings of shops on the left of the photo for the arrival of the tram to my grandparents’ suburb. In fact on other occasions we used the same route visiting my mother’s friends who lived at the end of the same tram line. In those “olden days” there were no traffic lights whatsoever to coordinate traffic flow through the Fiveways and you took your chances either as a vehicle or pedestrian. The only exception was the railway flagman and the central coordinating point for the trams, looking rather like a clock tower. As there always is with public transport (or so it seems to me) there was the inevitable time delay between the bus and the tram. 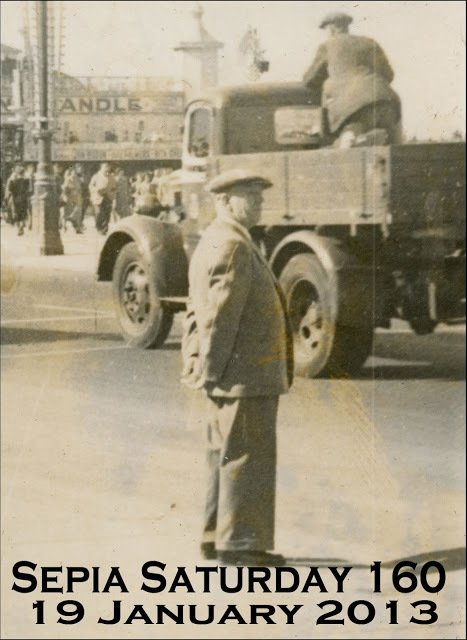 Sometimes the railway flagman would provide some distraction as he guided a train and carriages through the same intersection, with his red flag to alert and stop vehicles of all sorts. On other occasions it might be quite dull with nothing much happening. That was when I coached myself into spelling that complicated word Woolloongabba (pronounced Wool –un-gabba), an Aboriginal place name. From that “authoritative” source Wikipedia, it’s unclear whether the word means “Whirling Waters” or “Fight talk place”. Considering the Gabba’s whitefella way of merging five streams of traffic and pedestrians, either might have been meaningful even to the current day. It’s also apt in terms of those titanic cricket clashes that have occurred at the adjacent Gabba cricket ground. Once again the Gabba played a key part in my own history as my friend and I would routinely visit the Gabba during school holidays to watch test matches or exciting One Day matches against the West Indies (Wes Hall anyone?). You can click the links above to see more images which are still subject to copyright but viewable on Trove. In more recent years when my daughter lived not far from the Gabba we had regular outings to the Thai restaurant situated in the upstairs verandah of the building on the left. You can see why, for me, this Sepia Saturday image prompt brought so many memories flooding back. This entry was posted in Brisbane, Family History, Kunkel Family History, McSherry Family, Sepia Saturday and tagged Fiveways, Sepia Saturday, Woolloongabba by cassmob. Bookmark the permalink. Love reading ‘our’ placenames in blogs. Funny how evocative just an Auusie word can be. I mean Aussie of course! The thing that surprises me in these street views is the emptiness. Obviously there wasn’t much traffic then but despite that fact the streets were so wide, so spacious. The Brisbane city planners did a fine job! Peter, one of the reasons we had wide streets in a lot of places was the need to bring bullock teams through. They’re fairly old pictures (1900 and 1929) so not very busy. Later of course it was different, and now it’s crazy in that intersection but it has traffic lights now. Woolloongabba — I love that word! I must find something to rename “Woolloongabba” so that I can use it more often. In my city we have our own version of the Fiveways called Alexander’s Corner. It used to be the treacherous scene of numerous accidents before the city engineers redid the stop lights so that every road got its own light cycle. Yes it’s a great name isn’t it Wendy? Cycled traffic lights can make all the difference but it was a long time before the Fiveways had any. A lovely post Pauline. I have always loved the fact that Australia has such wide streets – different to here. It was a lovely memory. That is what I love about Sepia Saturday – is that I get to search for a photo to share and perhaps give a bit of detail to accompany it. I do not tend to and should give more text. Of course every time I look at those photos I see something different and perhaps think of something more I should research or contemplate. Since taking part my to do list has grown, but I love the sharing and interaction. Thanks Julie, yes very different to British and Irish country lanes. I’m not sure I need to find more things to research -the list is already too long. I am enjoying the Sepia Saturday post because it’s an opportunity for a snapshot (pun intended) of a particular time that I knew. I’m also enjoying seeing the different responses and comments from different readers. Delightful images especially the older one where I wondered what the man to the right of the tram is shovelling up. The Gabba is known to all cricket lovers and yes I’ve seen Wes Hall bowl – glad I wasn’t batting. If you think that the earliest photo was taken in the days of horses and carts you’ll figure it out Bob;-) Loved watching Wes Hall bowl -the West Indians were a delight to watch. It also occurs to me that I have a dim memory of men sweeping the tram tracks, presumably to keep them free from grit, dirt and the above-mentioned byproducts. That may also be what he was doing. This was so interesting! I really enjoyed learning of your holiday travels, and you pictures are fantastic. I love the way Australians nick name or shorten the names of places. The Gabba looks like a old western American town in 1900. Great photos. I totally agree! The moment I saw the man in the photo my thoughts went in one direction, and that led my post! Amazing are your photos and back story as well, thanks for sharing it with us! I had to make a double look at the one dated 09 I was think 2009 but I saw all the old cars and I remembered yes, that was 09 way back when!!! Ah yes. Wes Hall indeed! And there was a late night hamburger place at the Gabba in the 1960s – one of the few in town. I can see how the prompt prompted your images and memories, even though the two places are quite different..
Goodness me Brisbane looks a bit different nowadays! Certainly does, no longer a big country town. A perfect example of what Sepia Saturday is supposed to do : bring the memories rushing back for you and provide some fascinating insights to your readers. And thanks also for introducing me to the “Trove” site. Thanks Alan – and beware getting lost in Trove -it can be very addictive. There are many aspects to it but I guess most of would tend towards the photos and newspapers. Yes, indeed, Trove seems to be addictive — took a “quick” look and I was gone for a half hour or so. Yikes, what would it have been if I was actually looking for something. I really like those old pictures that so clearly show that “edge” of time where horses and wagons shared the streets (usually dirt or mud) with those new fangled motorized vehicles. And lastly, I was so glad that you gave the pronunciation of Woolloongabba — it was much less exotic and cumbersome than my garbled take on it. Thanks as always for a great post. Like the others I was fascinated by the Aboriginal name and the shortened version, of necessity I’d say. Great memories Pauleen. Thanks Little Nell. Glad you enjoyed it. I got it right! the pronunciation I mean 😉 We have a meeting of 5 corners here called “5 Points”. Not very imaginative is it? And one called…”Little 5 Points”. Neither is as wide and spacious as yours. Good one Kristin! Not easy with our indigenous names…but they are more interesting than “Five Points” I have to say. I guess the Gabba is spacious though it feels less so these days with traffic lights and lots if traffic, but no trams or trains as they are a lost history.